Efficiency nuts: be warned! I think I’ve just come across an amazing app for you! The thing is that there are apps, contacts and bookmarks you use at home and others that you need when you’re at work. Or maybe you have different activities that require a different set of apps, contacts etc. Are you tired of having to dig through your phone to find what you’re looking for? This is exactly where FolderOrganizer can come in handy; it gives you quick access to programs that you need. Want to know how it works? Find out in our test. FolderOrganizer helps you quickly access the most important items on your phone: programs, apps, or contacts. This is done with the help of specific labels. In other words, you can organize your phone’s content according to certain labels. Obviously, you are free to add any labels of your own like work, at home, hobby and so on. Here’s a quick example: You’d like to download some new apps to your phone. You’ve already set up an “Apps” label, which includes the AndroidPIT app, the Market, and the Barcode Scanner. Now you can simply add a shortcut for this label to your home screen. All it takes is one click to go directly to the app you need! If you don’t wish to add shortcuts for every label, you can also add different labels to your start menu. You can then filter out your favorites on the menu screen. This makes sense if you have a large amount of different programs and contacts. In the main menu, located on your status bar, you can also see your most contacted contacts next to your labels. This app is really golden! Looks so simple, yet can do so much. Once you’ve mastered the labeling system (similar to the one from Gmail and many others), you can quickly and efficiently organize your phone to fit your personal needs. 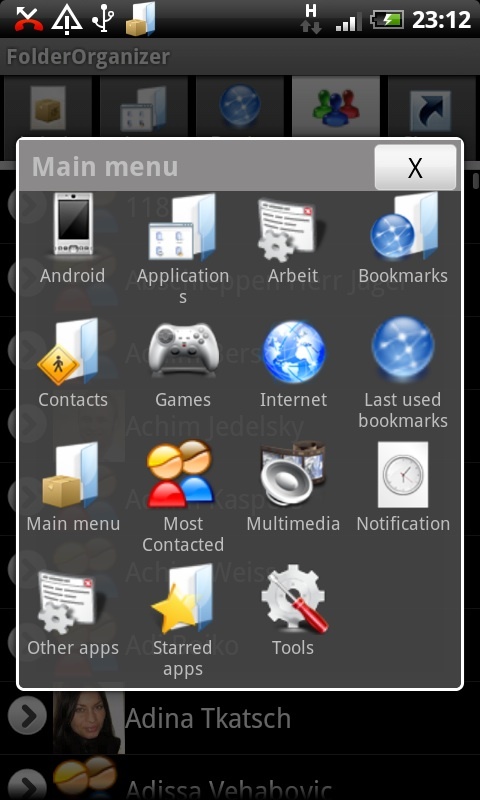 To top it all off, you can personalize your icons, start programs, delete apps – all using FolderOrganizer! You couldn’t wish for anything more, really. Five stars – no question about it! There have been similar apps available to solve your organization problems. Yet none of them managed to look as well-conceived and structured as FolderOrganizer. Almost 100% of all functions are done through the touch screen. 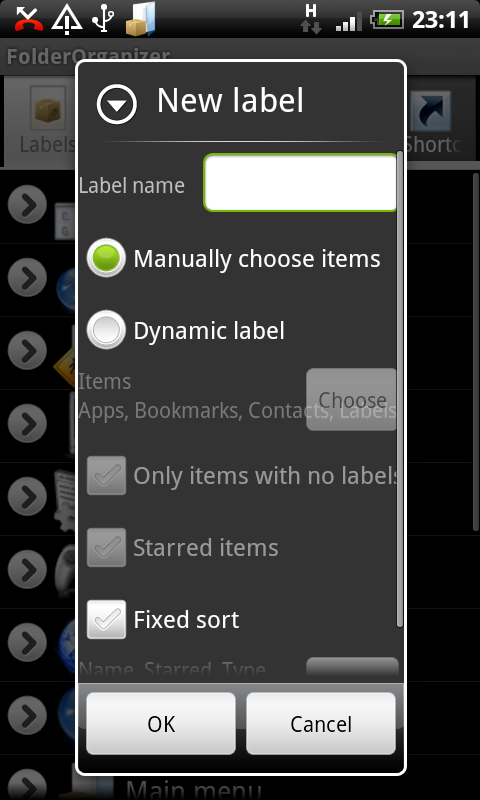 You can access the usual stuff via the menu button: import and export, create a new label, and adjust some settings. The app could perhaps use a better-looking user interface. Some of the icons are a bit too massive (e.g. contacts) and the heading bar could be a little more graphically “pimped out”. Not too big of a deal, but these drawbacks account for the lack of a five star rating. The app runs well and is very reliable. No crashes or program errors experienced. The app is available from the Market for €0.99. There’s also a free version available with ads. Totally worth the 99 cents, though. Ok.. tried app.. worked like it states.. but personally I prefer to just use the folder option that came with my Eris. The main advantage is that I can leave the folder open and still scroll though my other screens.. then return to still find my folder still open.. on this app I had to close out of folder first which was a deal breaker for me. Love this one. I had tried the demo, and within a week, picked up the paid app. I especially love changing the icons to match my wallpaper. Right now, my folders are disguised as satellites orbiting the moon. I only wish there were font setting options. Still deserves 4.8 in my book, though. Amazing app, this is a must have for any android user .. I'm going to check this one out, thanks!